research Is skating really unfair? Yes, even at 100m times. Two weeks ago, we published a Perspective article on how the starting procedure in racing sports could bias competitions. The article was met with very positive attention (even in the Huffington Post! ), and also some scepticism. We answered to the sceptics with a follow-up analysis of our data, which underscored our original point. In addition, some speed skating enthusiasts suggested we analyse the 100-meter times from the races we reported on. So we did! The results are very similar to our earlier results: Longer ready-start intervals lead to slower 100-meter times in Olympic speed skating. In a Perspective article in Frontiers in Psychology, we argued that random variability in the starting procedure of many racing sports could bias the competition. These variabilities arise from referees using a different interval between cueing the athletes to get “Ready”, and to fire the starting pistol once the athletes are in position. This duration of this ready-start interval is determined by how quick athletes get ready, and by the added temporal jitter (random variability) that the referee adds. The issue with this, is that the “Ready” cue will alert the athletes. From research in experimental psychology, we know that alerting cues make people quicker to respond to a target stimulus (such as the starting shot). This benefit is optimal with an interval of 500 milliseconds, and slowly decreases after that. So, we argued, athletes starting with a shorter ready-start interval will be more alerted than athletes with a longer interval. When an athlete is more alerted at the time of the starting shot, they will be able to respond to it quicker. This will also make him finish earlier. This is a strong claim to make based on just theory, so in the article we included data from the 500 meter speed skating event at the 2010 Winter Olympics. We observed a clear relationship between ready-start interval and race time: On average, the longer an athletes ready-start interval was, the slower they were to finish. 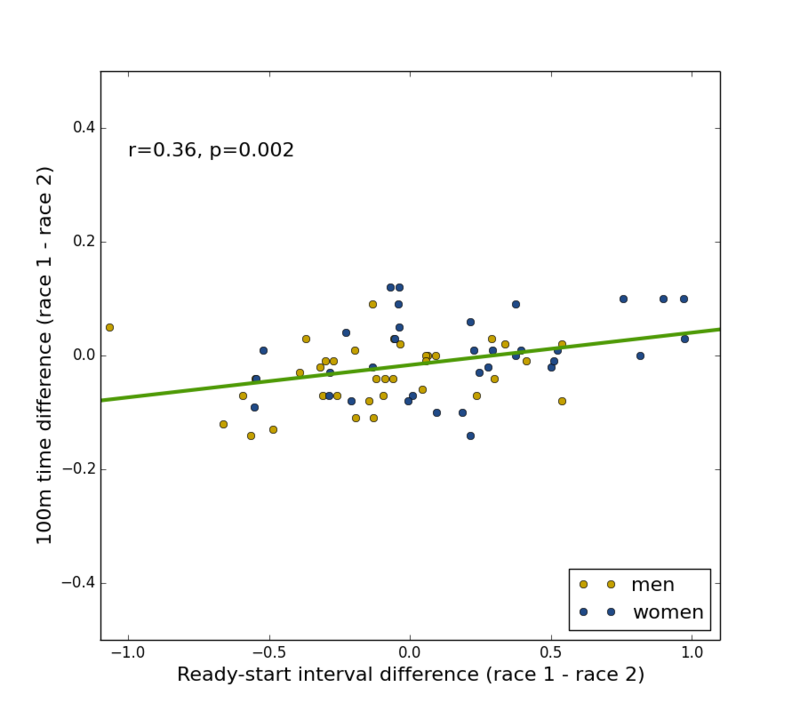 Some people argued that the causality might be opposite: maybe a better race time was causing a shorter ready-start interval. They argued that, maybe, quicker skaters were quicker to assume their starting positions. Although there is no scientific literature to support this, and although the speed-skating rules state that the referee must add random temporal variability, we were intrigued by this argument. Therefore, we did an extra analysis on the same data, and demonstrated that we were right about the causality: longer ready-start intervals lead to slower race times. Some skating enthusiasts were also intrigued by our findings, and they were asking what would happen if we looked at the 100 meter times of the current competition. Those times is what I analyse here. If speed skating is not your sport, you might be confused. There is a 500 meter competition, but not a 100 meter one. This is true. However, during the 500 meter competition, athletes also get timed 100 meters after the start. This gives a preliminary indication of how they are doing, and athletes can use this information in the rest of the race (e.g. to put in extra effort, or to pace themselves). Dr. F. van de Bult was curious to find out whether the ready-start interval had an effect on the 100 meter times, and he had learned that we were keen to share our data. So he asked for our data, and he collected the 100 meter times. He then shared these with us, and the analyses here are based on the data that he supplied. Thanks! We did the exact same things as we did in the original article, and in the additional analysis on the data from that article. For details on the methods, please refer to those. The longer a referee waits between “Ready” and “Start”, the slower athletes reach 100 meters! There is a correlation between the duration of the ready-start interval and the 100 meter times. The ready-start interval can explain 6.3% of the variance in men’s 100 meter times, and 13.9% in women’s. In the current dataset, on average, an extra second of ready-start interval relates to an extra 123 milliseconds in men’s 100 meter times, and an extra 200 milliseconds in women’s. Shorter ready-start intervals cause quicker 100m times, even when controlling for potential confounds. 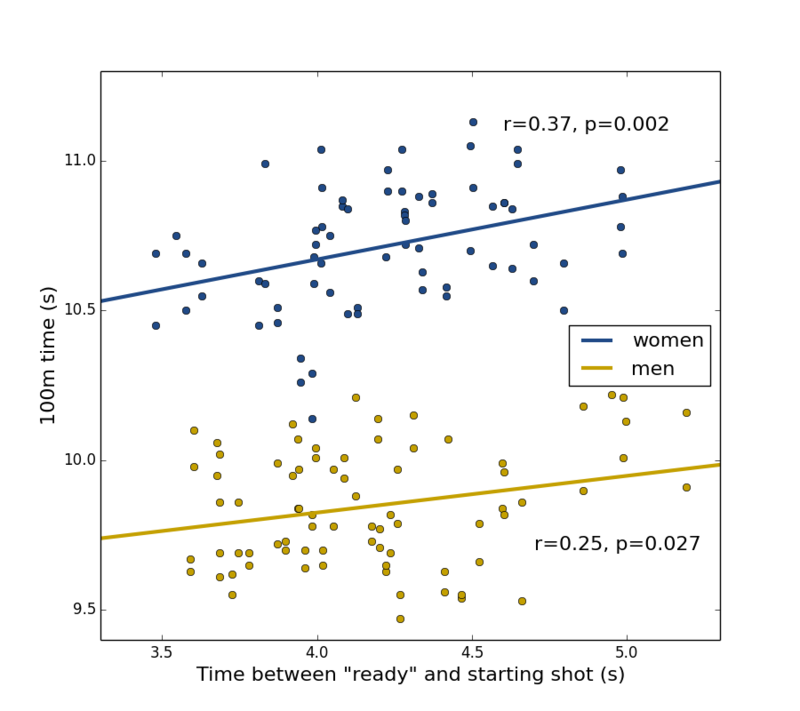 To answer the causality question, we performed a linear regression of the inter-individual differences in ready-start interval and in 100-meter time. The difference between the ready-start interval in athletes’ first race and their second race is a significant predictor of the difference between their 100-meter times in the first and second races. The difference in ready-start interval explained 13.1% of the variance in the differences in 100-meter times. In the current dataset, on average, an extra second of ready-start interval difference caused 59 milliseconds of extra difference in the 100-meter times. One important observation here is that the ready-start interval differences explained roughly the same amount of variance in the 100-meter and complete-race times. In addition, the effect that the ready-start interval has, scales from 56 milliseconds at the 100-meter point to 174 milliseconds at the end of the race (500 meter). This is interesting, as it suggests that a longer ready-start interval does not just cause a worse reaction time (due to less alerting benefits), but continues to plague the skaters during their races. Now, it should be clear that there is none to little scientific literature to explain this. But if we had to speculate, we would suggest it might be due to issues with athletes’ muscles, or with their motivation. It could be that a longer ready-start interval increases muscle fatigue, because it forces athletes to maintain their starting position for longer. It could also be that athletes realise when respond slower to the starting pistol (due to less alerting following a longer ready-start interval), and lose motivation for the rest of the race, which could suppress their overall speed. The time between when the referee cues speed skaters to get “Ready” and when he fires the starting pistol, has an effect on skaters’ performance. The longer the ready-start interval, the slower skaters are to reach the 100 meter point, and the slower they are to finish the race. alerting, attention, speed skating, sports. Bookmark.